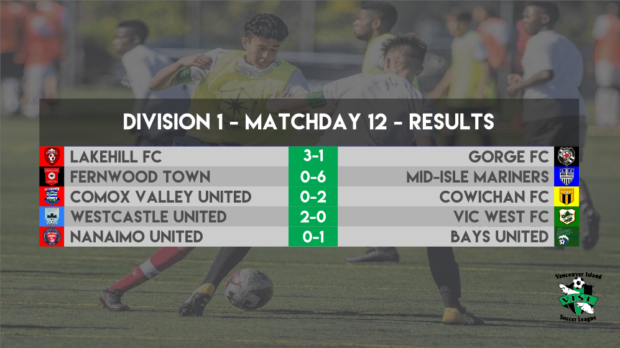 With all five Division 1 games played over the weekend, Week 12’s results did offer more confusion on to what has been a strange season in the top division. The lone Friday night game was at Braefoot and it was the battle of Saanich as Lakehill defeated Gorge by score of 3-1. Blair Sturrock had a monster night as he scored all three for Lakehill. Arbnor Jusufi tallied the single for Gorge. Fernwood’s woes continued as they were blanked 6-0 by leader Mid-Isle Mariners in Ladysmith on Saturday night. Colin Jacques hit a hat-trick for Mid-Isle, Dan Citra added two, and Shun Takano had a single. Earning the shutout for Mid-Isle was call up Keeper from the U21 Mid Isle team – Rory Pluym. Also on Saturday night, at Vanier Turf, defending fourpeat champs Cowichan FC shutout Comox Valley United by score of 2-0. Craig Gorman continued the welcome back pace by scoring both Cowichan goals, while Darian Achurch picked up another shutout. The VISL Game Of The Week was at Westhills on Saturday night and it had Westcastle hosting Vic West. The young team was too much for the Greens as they went on to win 2-0. Joshua Walter and Goteh Ntignee scored for Westcastle and Sachdev Grewal earned the shutout in goal for Westcastle. Game MVP was Westcastle’s Jonathan Walter. 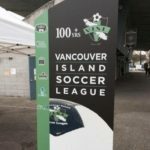 The final game of the round was up at Merle Logan on Sunday afternoon as Nanaimo hosted Bays Utd. Bays come away with a 1-0 win on a goal by Ryan Ashlee. Providing the clean sheet for Bays was Ethan May. After those weekend results, here’s how the Division 1 standings look in the chase for the Garrison Cup. 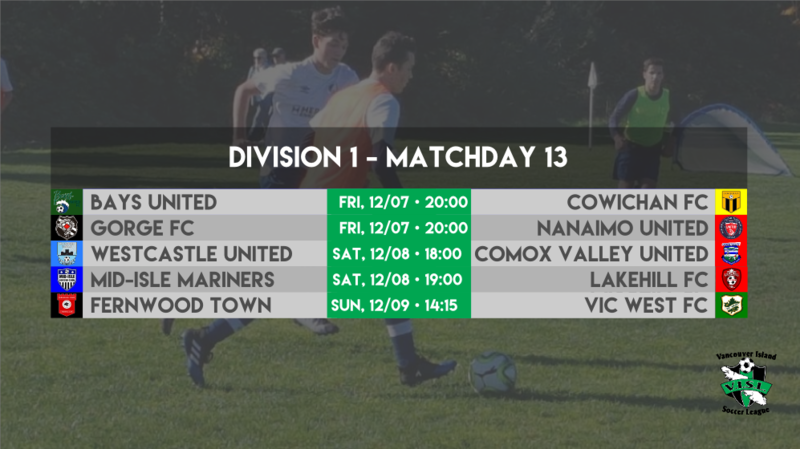 Mid-Isle are still hanging on in the top spot, with Lakehill nipping at their heels, but Cowichan have vaulted up and are right in the thick of things – especially as they have two games in hand on several teams around them. The Nanaimo loss saw them dip in the standings a bit, while Westcastle and Bays keep pace. Also note that Westcastle have two games in hand. 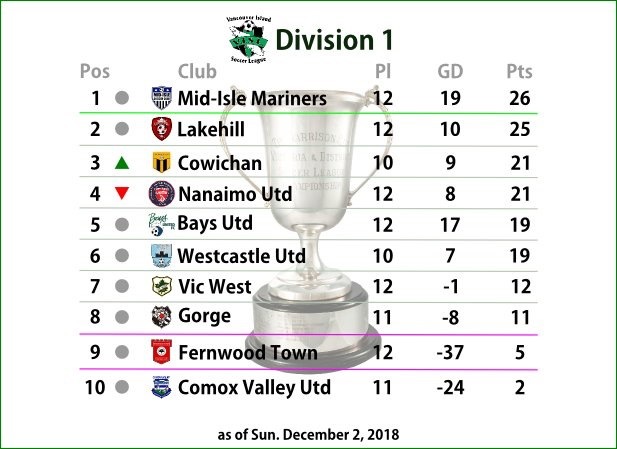 Vic West and Gorge are somehow still not able to get to the next level, and Fernwood and Comox are in the relegation zone. 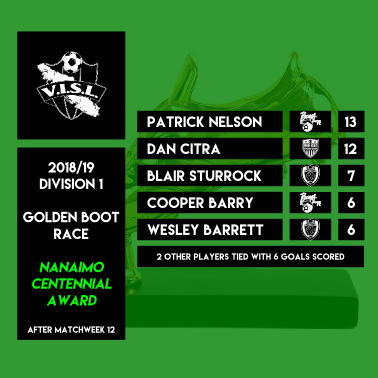 The scoring race also tightens up a little and here is how the race for the Nanaimo Centennial Award goes. A two man race for the most part, but definitely a couple other contenders. With just the one official week left in VISL Division 1 league play before the Christmas break, we hope the weather can hold out for the last set of matches, as no doubt it will make for an interesting break. There is no doubt that the VISL Division 1 has not had this parity in many years. This weekend should most likely add to the drama as there are several games that will have direct effect on the standings. Friday night starts out with a bang, with Bays vs Cowichan at Oak Bay High, which should be a dandy for many reasons. Will Bays continue to roll after their win over Nanaimo last week or will Cowichan continue to stifle teams and get more and more results? It will be a reunion of sorts, and I’m sure it will be an interesting game. Gorge are hosting Nanaimo at Hampton on Friday as well. Gorge have been bitten on many occasion and is amazing to see them not getting more positive results. Nanaimo have been struggling with injuries, so this will be a big test for both teams, with three very important points attached. Saturday has Westcastle hosting Comox at Goudy turf. Westcastle, off a fresh win over Vic West, will look to keep climbing the standings, while Comox will come down and battle as per normal. The ‘Game Of The Week’takes place in Ladysmith as division leaders Mid-Isle host second placed Lakehill. Both teams are having fabulous years and it will definitely depend on available personnel as to how this game plays out. Both teams are coming off wins, but both have also dropped some valuable points of late and this should be an excellent match. Fernwood hosts Vic West on Sunday and both teams are looking for a win in the worst way. It will be interesting to see what teams are on the field as both seem to be going through some challenges of late.